A natural rich brisket flavor and the brisket moisture are the main things that cooks look for when eating. The Butcher BBQ Prime Injection has a greater beef flavor over ourButcher BBQ Original Injection. This flavor has become the standard in competition. 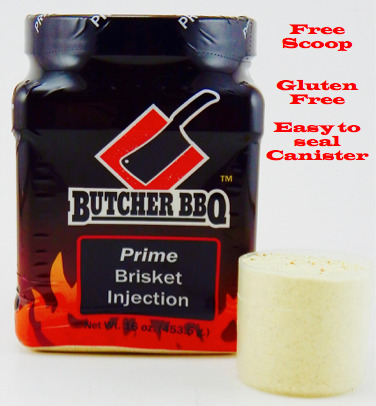 Our Butcher BBQ Prime Injection is the only injection on the market that comes in an easy to seal canister. Get a free scoop in every jar. If your cooking for a competition or in your back yard our Prime Brisket Injection has been awarded the highest prize possible to win the BBQ World Food Championship. All taste palates are different, so strengthen to your taste. We recommend starting with 3/4 cup of injection to two (2) cups of water. Other options are to split 1/2 the water with beer, apple juice, Cola or beef broth. We have taken science and cooking, combined them and made this simple to use injection for any cook can use and make your best tasting brisket ever.